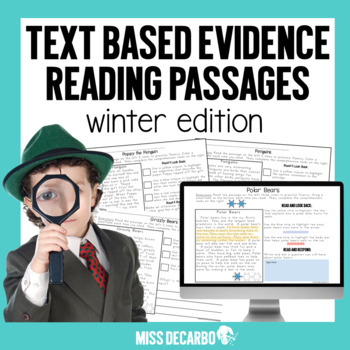 These winter reading passages for comprehension and fluency will get your students to USE the text and prove their answers! Included in this reading intervention pack for comprehension and fluency are 44 text-based evidence passages. 22 high-interest topics are covered. 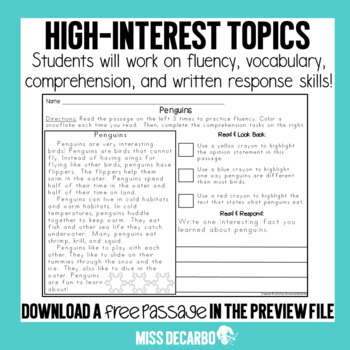 Each topic includes a nonfiction informational passage AND a related fiction passage so that you can provide paired passages and help students make connections across both genres. 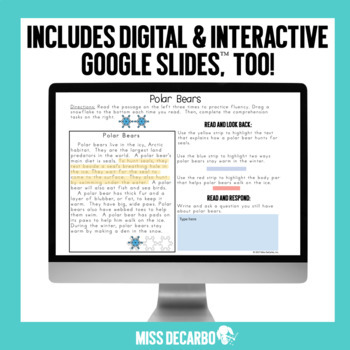 These interactive, hands-on passages provide your students with fluency, comprehension, and written response practice. Students read the passage three times for fluency. They keep track of the amount of times they read the passage (optional). The consistent format of the passages guide your students through the process of looking back into the text to support their comprehension and understanding with text-based evidence. Students will have a blast using their crayons to highlight and look for evidence! Finally, students practice responding to the text through a Read & Response activity. These response questions cover many big comprehension areas such as author’s purpose, inference, visualizing, questioning, identifying the main/central idea, making connections, and more! These passages are great to use in a whole group setting, small group setting, RTI, intervention classrooms, or as center work or independent work within the classroom. The passages are written within the second grade reading range, making them perfect for first-grade stretch texts or first-grade students reading above grade level, second and third-grade independent reading, below-target third-grade readers, at-risk fourth grade students, intervention students, and small group settings. This edition contains topics that integrate many science and social studies concepts, saving you time and resources! Practicing fluency and comprehension has never been so fun for students – and easy for educators! I hope you enjoy this learning! Want more passages?! You can grab enough for the whole year! OR...Grab my discounted BUNDLE PACK which includes ALL 4 Seasonal Text Based Evidence Packs! Do you have little ones that could use text evidence practice?